Israel has controlled East Jerusalem for almost 50 years. During that time, Israeli authorities have been responsible for municipal services, housing, and urban planning for Jerusalem’s more than 300,000 Palestinian Arabs. Yet even as Israeli politicians proclaim that Jerusalem will never be divided, the contrast between its Jewish and Palestinian neighborhoods is starker than ever. The poverty rate for Palestinians in East Jerusalem is near 80%, physical infrastructure in Palestinian neighborhoods is poor, public facilities are few and far between, and a chronic housing shortage leads Palestinians to resort to unpermitted construction, for lack of alternatives. Simultaneously, Israeli settlement and building and construction further consolidates Israeli control over the city, undermining prospects for a political resolution on the city. The inequity and friction between Palestinians and Jews in Jerusalem is in many ways a microcosm of the larger Israeli-Palestinian conflict. Join us to hear from Yudith Oppenheimer from Israeli NGO Ir Amim as she outlines key findings from its report, “Jerusalem: The Rising Cost of Peace,” a longitudinal mapping of developments on the ground from the introduction of the Clinton Parameters in 2000 until today. In context of the findings, Yudith will discuss the current forecast for a political resolution on the city. Yudith is joined by Nava Sheer (Bimkom – Planners for Planning Rights), who will present on the challenges facing those who advocate the development of planning policies and practices that are more just and respectful of human rights, and responsive to the needs of local communities in Jerusalem. Nava Sheer is an urban planner serving as the Geographic Information Systems (GIS) Coordinator at Bimkom – Planners for Planning Rights in Jerusalem. She has held numerous positions in the fields of economic development, transportation planning and community organizing in the United States and Israel. At Bimkom, Nava manages the organization’s mapping systems for its projects in affordable housing, urbanism and social justice for Palestinian Arab communities in Israel, East Jerusalem, Area C of the West Bank, and the Negev. Yudith Oppenheimer is Executive Director of Ir Amim, a non-partisan Israeli non-profit organization that focuses on the complexity of life in Jerusalem in the context of the Israeli-Palestinian conflict and the city’s political future. Yudith is a long time human rights activist, feminist and educator. 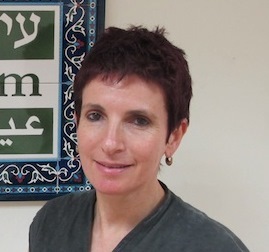 Before assuming leadership of Ir Amim in 2008, Yudith was a fellow at the Mandel School for Educational Leadership in Jerusalem, and from 2000 to 2006 she served as Executive Director of Kol Ha-Isha – The Jerusalem Feminist Center.